As you saw on my fall decorating blog post I have an “owl” thing going this year. I didn’t plan it, it just happen. I guess that means owls are big this year. See Fall house tour – the Beginning and Fall house tour- The rest. 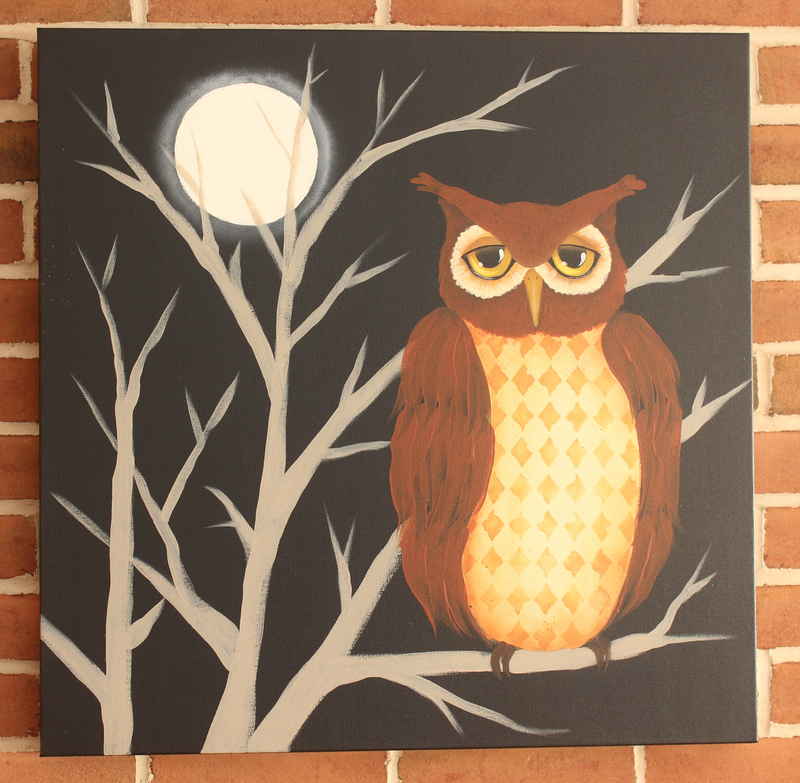 I wanted a painting of an owl, but wanted to keep is simple so I sketched out an owl and sized it to my canvas. I used a square canvas 24″x24″ and painted it Lamp Black (I used DecoArt paints). You could scale it to any size canvas. I then positioned my owl and traced it on. I outlined him in chalk so that you could see him better. I decided I wanted him to sit on a tree branch and have a moon showing through the branches. I cut a circle out of white paper for the moon and laid it in place. Them using a piece of chalk I traced around the moon and freehand the trees and branches. I painted the moon Warm White, the belly of the owl and around his eyes with Buttermilk. I use a 10 filbert brush and painted in the tree branches with Driftwood. I stenciled the belly with the Americana Decor Distressed Harlequin stencil. and Honey Brown. I also floated around the eyes with Honey Brown. Shade edges of belly and with Honey Brown. I divided the wings in three sections with chalk. Using a 10 filbert brush and starting in the bottom section of wings stroke on feathers with Burnt Sienna, then do the middle section have tips of feathers extend over top of lower section. Continue doing same in top section. Base in head with Burnt Sienna using small strokes at tips of ears. Paint irises and nose with True Ochre . Paint eyelids with Honey Brown and pupils and around eyes with Lamp Black. Float across top of wings, under forehead and eyes with Burnt Umber. Stroke on feet with Burnt Umber. Stroke around eyes with Buttermilk and small filbert or round brush. Float across top of iris and pupil with Raw Sienna. Paint a line with Cadmium Yellow on each iris starting at center left and going past center bottom. Strengthen a smaller portion of just painted line with brush mix of Cadmium Yellow + Warm White. Paint Warm White highlight comma on top right of pupil and a dot on lower left of pupil. Dry brush Warm White line on lower rim of each eye. Shade eyelids and nose with Raw Sienna, paint nostrils with Burnt Umber. Strengthen shading on belly with Burnt Sienna. Flyspeck owl with Burnt Umber. At this point I thought my moon needed something else so I Floated around it with Warm White. Remove any chalk lines and varnish. This is your owl so I encourage you to make him uniquely yours. Use a different stencil….different colors….even a different owl pattern. I painted this in about 3 hours. The thing that took the longest was waiting for the paint to dry between layers.